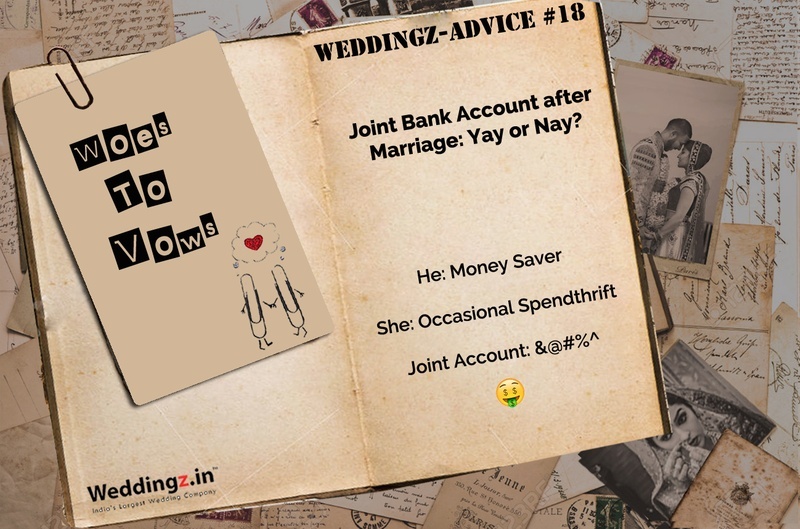 Joint Bank Account with Your Spouse – Good or Bad? Find Out! Should you open a joint account after marriage or not? Should you be happy about controlling your spend together or will you feel restricted? In today’s advice we try to solve this money maze for you! Read on. LOVE AND LIVE UNITED, BANK DIVIDED?! This wrong approach can easily make or break a relation. Your approach toward a joint bank account after marriage should be the opposite After the wed lock, it’s all about your, mine and ours. Initially, getting your head around day-to-day expenses tends to be difficult and overwhelming. These are testing times, just stay strong, reason out the situations and sail through it smoothly. Try out different ways of handling money matters to see what works best. Merging your finances may not be a good idea if you both are not comfortable with it. There is no need to rush things. YOUR DEBT, YOUR LOOK OUT! Beginning your marriage with a high debt load can be where the first crack in your marriage may begin to appear. Debts are the root cause for most disagreements to build up between couples. As much as you will not like what we’re about to say next, such a situation is unavoidable – once you tie the knot your partner’s debt becomes your problem too. Look for ways to pay off the debt as soon as possible without any late payments, as this can affect your credit score. If your partner has a debt before marriage and you don’t have a joint account together yet, get your assets protected from your spouse’s creditors through a prenup agreement and then seek methods on how you can pay off the debt. YOU’RE A SPENDTHRIFT – I CAN'T BE THE ONE SAVING FOR BOTH! Unplanned and unconscious spending is the second most common reason why couples fight. The arguments are always centred on one spouse spending more than the other, while studies prove that men and women both spend equally, it’s just that they spend on differently. If you choose to have a joint account and face this situation, sit down and discuss how much you will spending on daily things you need (which is generally taken care by the woman) and how much will you save for big purchases (which is generally taken care by the man). RISKY INVESTMENTS IS NOT MY BALL GAME – KEEP YOUR EYE OFF OUR RETIREMENT SAVINGS! Let’s admit it ladies, when it comes to money men are the risk-takers, while women try to play it safe. Though taking the plunge in big investments should not be based on how you feel its best to sit down with your partner and talk about your investment goals (if any) and time frames. This way you can divide the share of your amount in the joint account and let your partner take the risk with their share. You can always consult a broker or a financial planner for expert advice. While lying about your tiny purchases will do no harm, big secret trading or gambling can ruin your marriage. Having transparency helps especially when it’s about money matter. Joint accounts control your spends to an extent that keep you safe from jail terms at least. Think about it! If you’re the perfect kind of couple with a perfect career, perfect living and have absolutely no apprehensions about debt, there are chances you could be unprepared for emergencies. When all things go well and suddenly a financial mishap occurs, even the perfect kind of couple tend to panic! It is advisable to keep an emergency stash of 3-6 months aside for such uncalled for circumstances. What better than a joint account with your spouse or a money-market fund.